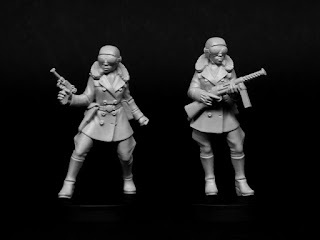 Khorosho Productions: Pulp Alley Sky Pirates - Pre-Order now! 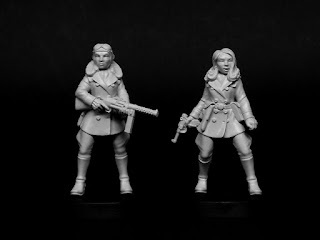 Pulp Alley Sky Pirates - Pre-Order now! 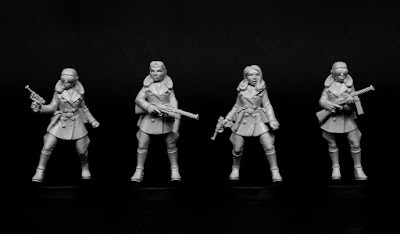 Statuesque Miniatures and Pulp Alley are pleased to announce the Pre-Order of a new collection of Pulp Alley Miniatures – The Raven Squadron Sky Pirates! "THE RAVEN SQUADRON – Led by the mysterious and cunning ace known only as The Raven. These sky pirates are the scourge of the air and shipping lanes all around the globe - feared for their fierce and daring raids from Soerabaja to Saskatchewan." Sky Pirates – Set 1 includes The Raven and her SMG-armed Sidekick, Number-Two and is available at a Pre-Order price of £6.95, saving over 10%. 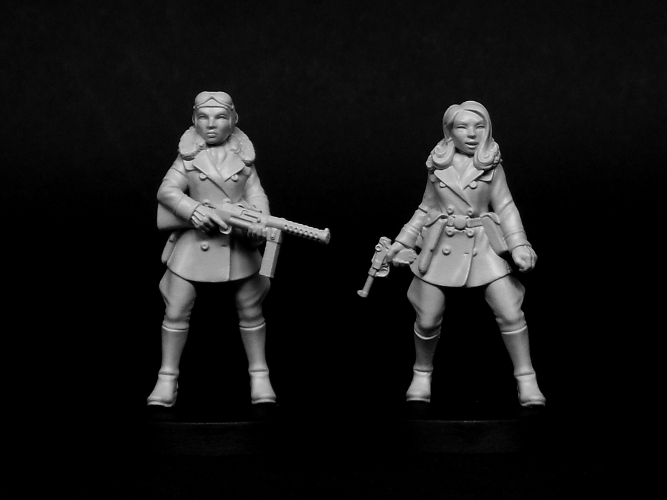 Sky Pirates – Set 2 includes the begoggled duo Twenty-One and Twenty-Four, armed with a pistol and deadly SMG respectively, and is also available at a Pre-Order price of £6.95, saving over 10%. 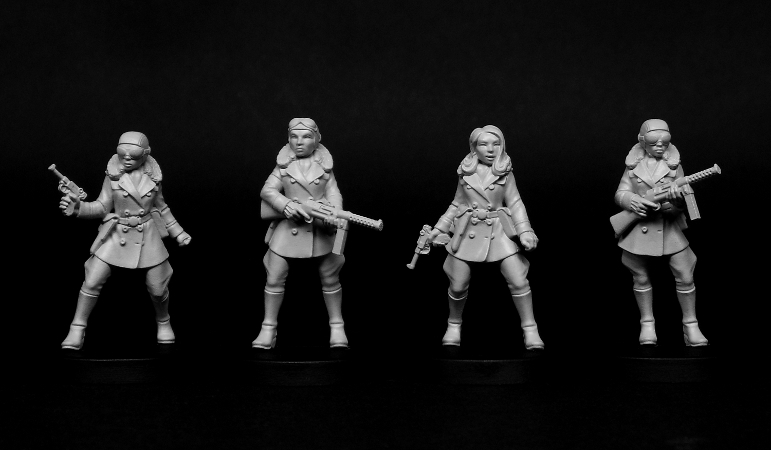 At Statuesque we also have all four figures in The Raven Squadron, priced at only £13.50 during the pre-order. Additionally, until the 23rd of January or while stocks last, any order that contains any Sky Pirate, Mak & Gauge or Pulp Heroes and Heroines set with the optional Pulp Alley Character Cards will also get a FREE Sky Pirate Gauge card. 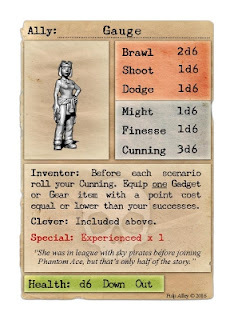 This unique card depicts Gauge as an Ally during her time with the Sky Pirates. 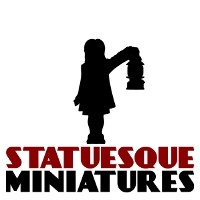 These figures are available from Statuesque Miniatures in the UK and Pulp Alley in the US. The Pre-Order offers run until 23rd January or while stocks last. Any order containing a Pre-Order item will be posted on this date (or with luck earlier if all the ducks align).